A U.S. trade panel has found that low-cost solar panels imported from China and other countries have caused serious injury to U.S. solar manufacturers. The unanimous vote Friday by the International Trade Commission sets up the possibility that the Trump administration will impose tariffs that could double the price of solar panels from abroad. Georgia-based Suniva Inc., and Oregon-based SolarWorld Americas brought the case. They say a flood of imports has forced Suniva into bankruptcy and led SolarWorld to lay off most of its workforce. 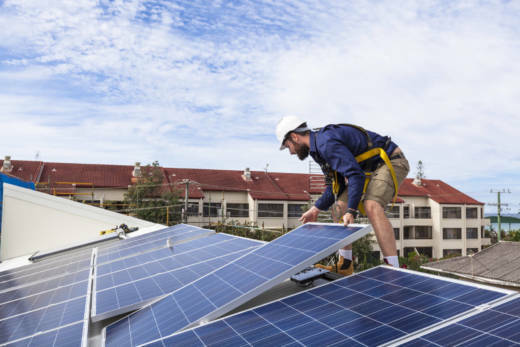 Cheap imports have led to a boom in the U.S. solar industry, where rooftop and other installations have surged tenfold since 2011. The trade commission has until mid-November to recommend a remedy to President Donald Trump, with a final decision on tariffs expected in January. A White House spokeswoman declined to comment. President Donald Trump is considered sympathetic to imposing tariffs as part of his “America first” philosophy.